Ahead of his return to Ireland, funk legend George Clinton talks about his friendships with Prince and Kendrick Lamar, why the Trump presidency is on borrowed time and what Obama did right. 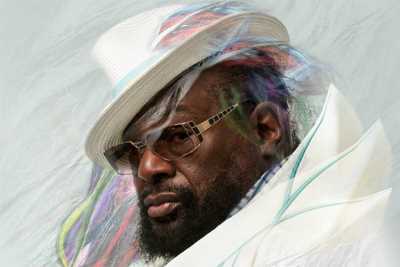 George Clinton has spent the past year working through the many stages of grief. He was devestated when Prince, his friend and protege, passed away unexpectedly in April 2016. But time has brought closure and several weeks ago he made a symbolic pilgrimage to the late icon’s Paisley Park complex in Minneapolis. Clinton remembered that lesson when introduced to an obscure South Central LA rapper several years ago. The kid was raw – but, as with Prince, the talent burned bright. He was also politically outspoken, which reminded Clinton of his younger self. Parallels have been drawn between Lamar’s 2015 masterpiece, To Pimp A Butterfly, and Clinton’s 1975 opus Chocolate City. Part of a winning streak of albums put out by Clinton through the ’70s, the record is a valentine to those US conurbations with a black majority population and imagines a fantasy African-American White House, with Muhammad Ali as President, James Brown as Secretary of State and Stevie Wonder as Secretary of Fine Arts. Clinton, who returns to Dublin for a Vicar Street show on May 16, is a singular figure in African-American music. He didn’t create funk – but, with his bands Funkadelic and Parliament, helped turn it into a cultural juggernaut and a delivery mechanism for strident social views. Politics was always a driving force. He grew up in New Jersey and spent his adolescence passing through local doo-wop ensembles. That led to a job as songwriter at Motown, from where he launched Parliament and the more rock-orientated Funkadelic. Initially a contemporary of James Brown and Jimi Hendrix, through the ’70s Clinton became increasingly anti-establishment. He has been heralded by The Nation magazine as the African-American Woody Guthrie, with his 1978 smash ‘One Nation Under A Groove’ reading like a manifesto for a post-racial United States. In the ’80s he entered a new phase of his career as father-figure to an emerging generation determined to play by its own rules. They included Prince, Public Enemy and NWA (he and Dr Dre remain close). Kendrick Lamar is part of a proud lineage of artists championed by Clinton. He is set to continue in that vein with a forthcoming new collaboration with Thundercat and Flying Lotus. The record is to be an attack on Big Pharma, which he believes consciously exploits the poor. Clearly Trump could care less about this constituency. Might former President Obama have done more for them?